After witnessing students’ lives miraculously transformed by the Academic Associates® approach to reading instruction, numerous amazed parents and teachers have openly wondered why schools do not generally use this approach, and whether there is any scientific research to support it. The following brief synopsis is an attempt to initiate an answer to those questions. Systematic and explicit phonics instruction is more effective than nonsystematic or no phonics instruction. Systematic and explicit phonics instruction significantly improves children’s word recognition, spelling and reading comprehension regardless of socioeconomic status. These aforementioned conclusions were part of what was supposed to be implemented under the “No Child Left Behind” programs. However, the schools did not ordinarily teach “systematic and explicit” phonics, and it also was not used as a foundation for all reading. Furthermore, the kind of phonics taught was typically not “synthetic,” but “analytic” phonics. “Analytic” phonics teaches to the wrong parts of the brain and acts similarly to the “whole word” method. Consequently, the reading instruction part of NCLB was a failure. As a result of this, many teachers today think a strictly phonics foundation is untenable. They opt instead for a “balanced” approach, in which graphophonemic (phonics) cues are used along with context cues, syntax cues, picture cues, configuration cues, etc., to help children guess at words. However, that is not reading; that is simply guessing. An astounding 68% of our students are unable to read at the proficient level, and three out of four children who are in “special education” programs have been unable to return to mainstream classroom reading (with deleterious consequences continuing throughout their adult years), as a result of this “balanced” approach. A FOUNDATION OF ANALYTIC OR SYNTHETIC PHONICS? In analytic phonics, whole words are taught first and then, later, analyzed into sounds. In synthetic phonics, sounds and associated letters are taught first and, afterward, synthesized into words. Synthetic phonics is the traditional approach in which words are “sounded out” left to right, letter by letter and syllable by syllable. AP is still a whole word, meaning-based approach which accesses the wrong parts of the brain. Unless a child is given a foundation in synthetic phonics first, using this kind of approach “hardwires” the brain to read incorrectly. Substituting a foundation of analytic phonics can actually cause learning disabilities in children who have a difficult time switching back to reading letter by letter in SP sequence. Some confusion regarding this subject exists because analytic phonics may be harmless once a foundation of synthetic phonics properly trains the brain to read phonetically. Because many recent American scientific studies do not clearly set analytic against synthetic phonics, I would like to highlight one from overseas. In 2005 a seven-year longitudinal study of 228 children was completed by the universities of Hull and St. Andrews in Scotland which examined whether students made better progress in reading and spelling when taught by the synthetic or analytic phonics approach.4 At the end of the first year, which began with a sixteen-week, “20 minute per day” scripted training, the synthetic phonics group was reading words around seven months ahead of the other two analytic phonics groups. It was also ahead by eight to nine months in spelling. For years two through seven, the synthetic group gained significantly over the years, even though the training program ended in the fourth month of year one. In year two, it was 11.5 months ahead in word reading, and in year seven it was three years and six months ahead. For spelling it was one year ahead in year two, and one year and nine months ahead in year seven. In year two the SP group’s comprehension scores were seven months ahead, and by year seven they were still three and one half months ahead. The lesser increase in comprehension as the children matured may possibly be the result of the fact that the synthetic group was disadvantaged. They were purposely taken from “significantly less advantaged homes” to ensure any gains from synthetic phonics would not be improperly influenced by home environment. The study concluded that a synthetic phonics program “has a major and long lasting effect on children’s reading and spelling attainment.” They discovered, “these skills were found to be increasing many years after the end of the programme.” The study also demonstrated that simply adding phonics or phonological elements to a whole word or AP approach was fruitless. The key to reading success was in providing an initial foundation in synthetic phonics. Furthermore, although in a recent international study boys were found to have significantly lower levels of reading comprehension than girls in all 35 countries surveyed, the boys taught with an SP approach in this study comprehended text as well as girls. In February of 2010 Carnegie Mellon University scientists, Timothy Keller and Marcel Just, uncovered the first evidence that intensive instruction in traditional phonics to improve reading skills in children actually causes the brain to physically rewire itself. The children in the study with reading problems had decreased microstructural organization of the white matter (the brain tissue that carries signals between the areas of grey matter, where information is processed) in a region of the left frontal lobe. The scientists were amazed to find that the students who had received the phonics reading intervention had not only substantially improved their reading skills, but also increased the quality and quantity of their compromised white brain matter up to normal levels! The amount of change in diffusion among the treated group was directly related to the amount of increase of phonological decoding ability gained by the children. The students’ increase in reading ability, as well as the increase in white brain matter growth, correlated perfectly with the level of improvement in sounding out words phonetically! “Neural Systems for Compensation and Persistence” was a study completed in 2003 by Dr. Sally Shaywitz and eleven others including G. Reid Lyon of the U.S. Dept. of Education. The young adults in the study had been subjects in a previous one entitled the “Connecticut Longitudinal Study.” Since 1983, when they were five years old, their reading had been tested at grades 2, 4, 9, 10 and 12. Incomprehensibly, no information was given about the method originally used to teach these students to read in 1983! Nevertheless, the study itself cannot hide that information. The subjects were divided into three groups depending on their scores in the previous Connecticut Study. One group was labeled NI (nonimpaired), the second was AIR (accuracy-improved readers), and the third PPR (persistently poor readers). One of the tests, called “nonword rhyme,” was to read orally two rhyming words, which were spelled differently (such as “LEAT” and “LETE”). The final scores on this test for the three groups, 88, 81 and 71%, were all below the “frustration” threshold of 90% for tests of connected oral reading. That means even if the good, “non-impaired” readers had been presented with a test on new connected oral reading containing difficult vocabulary, they might all have failed. Their failure in this test demonstrates none of the students had been taught true phonics. Because they all had been taught by the meaning of the print, or by analytic phonics, even the best readers were not reading up to their potential. Dr. Shaywitz laments she finds a 20% rate of dyslexia. One has to wonder if it is possible that a meaning-based approach to reading instruction bears some measure of responsibility for this figure. The comparable rate for phonics taught students is only 2%. Shaywitz’s Overcoming Dyslexia demonstrates that nonimpaired readers read solely from the left side of the brain, while dyslexic readers try to compensate for their difficulties by using other parts of the brain (See Illustration A below). Illustration B, below, exhibits fMRI results for children after one year of “effective reading intervention.” One must read between the lines and search related studies to discover the decisive and effective intervention alluded to was phonics instruction. As you can see in Illustration B, the activation patterns after phonics-based reading intervention were comparable to those obtained from children who had always been good readers. The formerly “learning-disabled” children who are now good readers are reading completely and exclusively from the left side of the brain. It is not surprising that these are the very areas activated when anyone is taught synthetic phonics. 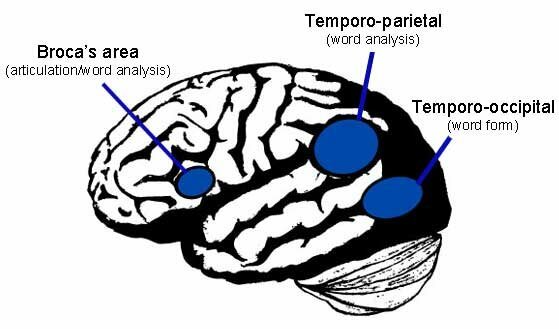 In beginning readers and whenever new words are encountered, if a student has been taught synthetic phonics, all essential information about the word is analyzed primarily in Broca’s area and the Temporo-parietal region and then stored for instant retrieval in the Temporo-occipital region. Everything, including phonics, decoding/syllabication, spelling, grammar and meaning is stored properly and together, making reading quick, easy and enjoyable. Furthermore, all this can be done from the left side of the brain alone (See Illustration C). When students are forced to use other areas of the brain in their attempts to piece together context, configuration, phonics and picture “cues,” reading can become a nightmare. Our experience at Academic Associates® Reading Clinic in Roselle substantially confirms and corroborates all these studies. We have found that when we lay a foundation of intensive, systematic, synthetic phonics in a young, nonreader’s life, she will not become learning disabled. In fact, she will enter kindergarten or first grade years ahead of her classmates. Conversely, when we “retrain the brain” of an impaired reader to read phonetically, over time the disabilities engendered by bad reading habits–taught by a “balanced” approach of guessing–are overcome. A joyous metamorphosis occurs, and, in many cases, that child begins to read as if she never had a so-called “learning disability.” Even in instances where other interventions have failed, we have been thrilled to see discouraged lives and families transformed, permanently and positively, forever! The following illustrations were drawn by Courtney Brobst and demonstrate certain fMRI findings from Sally Shawitz’s studies. The nonimpared reader, on the left, activates neural systems that are mostly in the back of the left side of the brain; the dyslexic reader, on the right, activates systems on the right side and in front of the brain on the left. 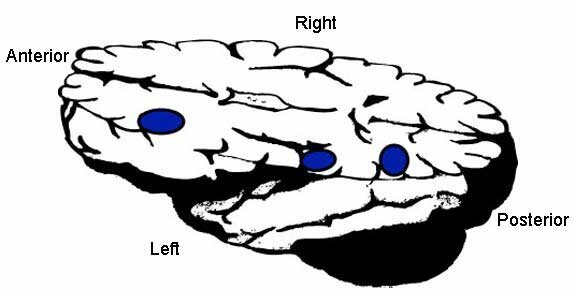 Dyslexic children have developed totally left-side reading systems (shown in blue), in both the front and back of the brain, after just one year of effective reading intervention. “Put Reading First—K-3rd Grade,” National Institute for Literacy, Second Edition June 2003, p.12-19. See “The Nation’s Report Card on Reading” from the National Assessment of Educational Progress. It does not matter what year you choose, because this problem has not been ameliorated for decades. Examples of AP are: A) Substituting one consonant for another at the beginning, ending or middle of words to make a new one by comparing and contrasting (slip/slop, cat/fat). B) Using whole word analogies in “cut and paste” style such as cat + mop = cop. C) Word families (e.g. The “at” family). Sally Shaywitz, Overcoming Dyslexia: A New and Complete Science-Based Program for Reading Problems at any Level, (New York: Vintage-Random House, 2003), 26-35. Geraldine E. Rodgers, “The Born-Yesterday World of the Reading ‘Experts’: A Critique on Recent Research on Reading and the Brain,” (Published October 8, 2003 and available through 1stbooks.com). Downloaded from www.donpotter.net , p. 34.